If you’re lucky enough to be going on a Jamaica family beach vacation, then you’ll probably be wondering all kinds of things: like will I need to drive? Should I rent a moped? Or hail a taxi? What about currency in Jamaica? Here are a few little helpers for getting around this beautiful island and navigating your way around Jamaica on your family beach vacation. Jamaica is a large island without a highly developed public transportation system. If you plan to stay in the general area of your hotel or resort, a car is not necessary. If you plan to explore the island, a rental car is a wise choice. Rental rates are high. Be sure to deal only with agencies whose names are known in the US. Rentals are available at both airports. — Drive on the left side of the road. Gas is measured by the imperial gallon (a British unit of measurement that’s about 25% more than a U.S. gal. ); most stations don’t accept credit cards. Your valid driver’s license from home is acceptable for short-term visits. 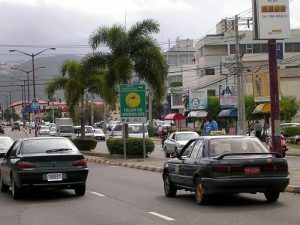 A coastal route designated by an “A” plus a number encircles Jamaica. It’s well marked and easy to follow. More complicated are secondary roads, urban streets, and feeder roads, whose markings sometimes are infuriatingly unclear. Recognizing this problem, the Tourist Board has issued one of the best maps of the island, the Discover Jamaica road map. It contains a detailed overview of the entire island, as well as blowups of Kingston, Montego Bay, Negril, Mandeville, Spanish Town, Port Antonio, and Ocho Rios; there’s also a very useful street index to Kingston. Get it from any Tourist Board office or car-rental agency. Mileage Information: Subject to road conditions, driving time from Montego Bay to Negril (about 52 miles) is 1 1/2 hours; between Montego Bay and Ocho Rios (67 miles), 1 1/2 hours; between Ocho Rios and Port Antonio (66 miles), 2 1/2 hours; between Ocho Rios and Kingston (54 miles), 2 hours; between Kingston and Mandeville (61 miles), 1 1/2 hours; and between Kingston and Port Antonio (61 miles), 1 1/2 to 2 hours. Taxis can be flagged down on the street or summoned by phone. Rates are per car-not per passenger-and 25% is added to the metered rate between midnight and 5am. JUTA cabs are supposed to have meters, but most of them are not in working order. Agree on the price of the trip before booking. Cab fares should be posted inside the taxi; if you don’t see them, you have the right to request a copy from the driver. A 10% to 12% tip is usually added. Avoid pirate or unlicensed taxis. Not only are they not metered-they are illegal and rarely carry insurance. The front desk of your hotel can usually arrange the rental of a moped or motorcycle. Also note that Jamaica has it’s own money system. Currency wise Jamaica has its own dollar, which is far less valuable than the U.S. dollar. In all monetary exchanges, determine which dollar unit is being quoted in the price, Jamaican or US. All the major resorts and first-class restaurants quote prices in U.S. dollars, so many visitors can go through their entire trip without converting their currency into Jamaican dollars. Its still a good idea to carry some Jamaican dollars: For some transactions, such as a drink of coconut water from a roadside vendor, prices are only quoted in Jamaican dollars. If you have Jamaican dollars left over at the end of your trip, you’ll need to show exchange receipts from a bank or other official bureau for the local dollars you purchased. This is a rather cumbersome process. Exchange only the amount of Jamaican money you think you’ll actually need. Just a few tips I thought might be helpful for navigating Jamaica on your family beach vacation! If you’ve been to Jamaica for your family beach vacation, leave us a comment about your adventures!